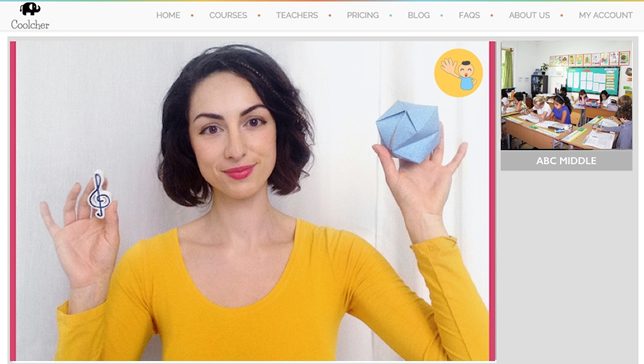 Schools now have a new choice for setting up online lessons from around the world. Education technology company Coolcher launched a new platform that provides a way for schools to schedule virtual courses delivered by teachers near and far. Current offerings include courses on "The Sun, the Moon, and the Planets" for students aged 7-11; "Designing with Adobe Illustrator" for students 9-19; and "It Was Invented in America and You Can Make it too" for ages 6-15. The classes last multiple weeks for a certain amount of time each week. For example, the latter class lasts for 12 sessions, one class per week for 45 minutes. Coolcher classes take place in real time and feature access to live teachers. Classes take place in real time. When a student has a question or wants to make a comment, he or she pushes a button on the screen and the teacher can set up a video interaction that can also be viewed by other students. Students can participate via mobile phone. If a class is missed, it's archived and can be viewed in recorded form. The focus of the courses is on creativity and cultural topics, including foreign languages, art, technology and music. "More and more, every high-paying job requires not just skills but creativity, and to boost creativity the development of the right brain should begin at an early age," said Jatin Grover, the founder of Coolcher, in a press release. "Our unique courses in creative areas and multi-linguistics speed up the development of students' right brain as well as giving them tools for college preparedness by teaching world cultures." Currently, the company is seeking schools or districts willing to run free pilots in multiple classrooms.